You are here: Home / FREEbies / FREE Pancakes At IHOP! It’s that time of year again! Tuesday, March 3th is IHOP’s National Pancake Day where you eat get FREE pancakes and any and all donations go to the Children’s Miracle Network Hospitals! Since beginning its National Pancake Day celebration in 2006, IHOP restaurants have raised almost $16 million to support charities in the communities in which they operate. 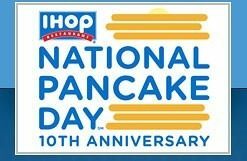 On March 3, 2015, guests from around the country will celebrate a “Decade of Giving” with the tenth annual National Pancake Day at IHOP restaurants and enjoy a free short stack of Buttermilk pancakes*. In return for the free pancakes, guests will be asked to consider leaving a donation for Children’s Miracle Network Hospitals© ** or other designated local charities.